How to integrate to integrate SalesForce to send responses as field values in standard and custom object and get feedback from closed cases. Salesforce is one of the dominant and robust CRM out there. Now you can send your Survicate data to create automated scenarios across multiple teams. 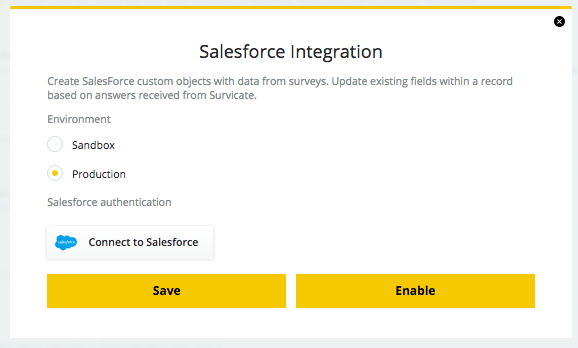 What you can do with Survicate + Salesforce integration? Map survey responses to any field in your Salesforce Standard Objects (Lead, Contact, Company, Opportunity, Case, etc) and any Custom Objects you created. Embed surveys in emails sent upon closing a case to get feedback about your Support team performance. Generate new leads or contacts from your website with Survicate targeted contact forms right from your website. You will be redirected to a Salesforce page, where you will need to provide your credentials. As you can see on the screen above you can enable Salesforce integration on your Sandbox environment, so you can test how integration affects you processes first 😃 Just remember to change for Production after tests! If you want to update your Salesforce Objects with your surveys, you need to enable integration on survey level. When you have integration enabled create a survey or go to existing one and click Send answers to this question to SalesForce. Then pick the Object you want to update and Field you want to fill. We will automatically add all the data gathered to fields connected to the specific mail. You can update as many objects and fields with one question as you want. ❗️Just remember that we work only on existing objects and fields so if you want to add answers as values to custom fields you need to go to Object manager and pick the object you want to update. Go to fields & relationships, and add new field. We recommend using the text type of field for any of your surveys. Despite updating fields, we can also add static values for every person that responded specific survey. To do it, you need to go to Settings > SalesForce integration and click the checkbox. Then pick the object and field you want to send a value to. ✅ Here you can also choose several objects and fields to send values to!